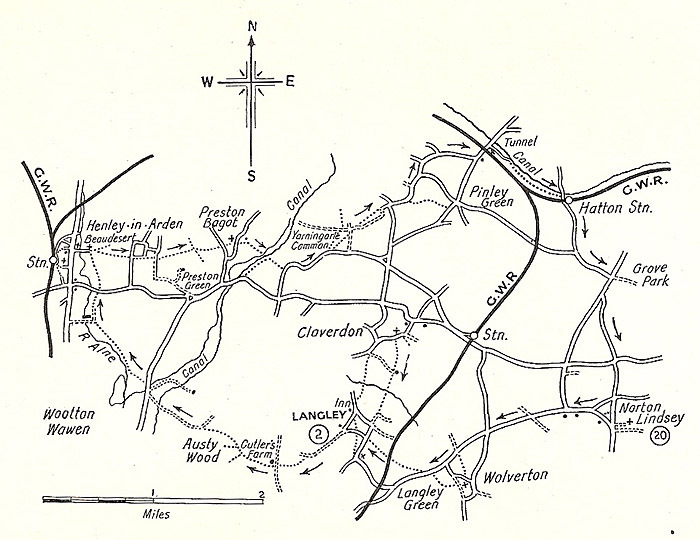 A map of the Great Western Railway's Ramble starting at Hatton progressing through Norton Lindsay, Langley, Yarningale Common and returning to Hatton station. Ramble No.1 - Hatton, Norton Lindsey, Langley (6 miles), Henley-in-Arden (9 miles), Yarningale Common (11½ miles) and Hatton (14½ miles). Henley-in-Arden is a name that breathes romance and the town itself does not belie its name, for it is a really picturesque, unspoiled place. It has a thirteenth-century market cross, which, though in good condition, looks its age and, the town being once in the heart of the Forest of Arden, which yielded a plentiful supply of oak, there are numerous old timbered houses that create a delightful old-world atmosphere. Its situation among the hills, which afford wonderful views, as charming as the town itself and, though most of this walk does not strictly come into the northern inner walking tour, it is well worth making the extra small circle to include so exquisite a gem.